The CSX Corporation operates one of two large eastern United States railroad systems, reaching into Michigan as well as Chicago, New York and Boston in the north, and as far south as Miami, Florida. CSX in Michigan is the successor company to the Pere Marquette and Chesapeake & Ohio railroads. It enters Michigan in two locations, north from Toledo and northeast to Grand Rapids from Porter, Indiana (Michigan City). Plymouth is the heart of the cross, with the line from Toledo coming north and heading to Flint. The east-west main line extends from Detroit through Plymouth and then west to Lansing, Grand Rapids, and then southwest to Indiana. In Michigan, CSX has large yards in Detroit (Livernois, Rougemere, Oak (NW Detroit) and Sterling Heights), Flint, Lansing, Grand Rapids (Wyoming), and Holland (Waverly). CSX also operates under trackage rights from Flint to Sarnia, Ontario through CN's rail tunnel at Port Huron. In partnership with Norfolk Southern, CSX owns the Conrail Shared Assets in the Detroit terminal. 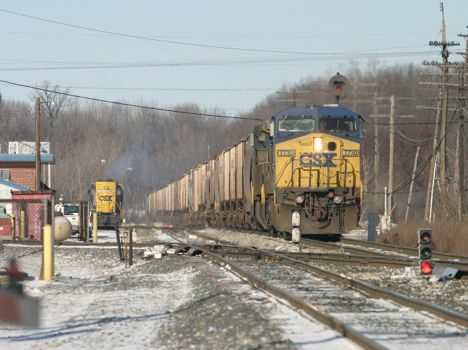 This allows CSX access to Detroit area yards and industry. Conrail Shared Assets also has a short cut route between Melvindale (NS Bridge) and Carleton, cutting time off the Toledo-Detroit route.